Streaming providers Netflix partner with Airtel, Vodafone and Videocon in India. Netflix CEO Reed Hastings visited India at present and announced three major partnerships in the country. After joining with top direct to home TV services in India that is Airtel digital TV and Videocon D2H, Netflix will now be available through the decoder without the need for a smart TV or other dongle like Chrome and Apple TV. Netflix also has a partnership with Vodafone to enable billing for the operators so the postpaid and prepaid customers pay their Netflix subscriptions as part of their monthly balance/prepayment. "India is one of Netflix's most important and most dynamic country in the world and we are pleased to partner with three of its major brands so that consumers can enjoy Netflix services with ease and anywhere in the country," said Hastings. "In the coming months and years, we look forward to bringing our Indian members of the most attractive stories from all over the world, and an ever-better visual experience and unbelievable joy. The Netflix app will be integrated with the Airtel DTH decoder and the Videocon D2H so that the viewer can watch Netflix content on their normal TV without dongles or Smart TV. To watch Online internet TV provider Netflix services you still need a separate Netflix subscription, and Airtel dth or Videocon dth set-top boxes with Ethernet or Wi-Fi based internet connection. "Airtel has been a pioneer to bring the best of global content and products to its customers and we are delighted to partner with best streaming providers like Netflix," said Gopal Vittal, CEO and CEO of India and South Asia Bharti Airtel. Videocon seems a little further to go because it will add a netflix button to its set top boxes, so you can go right into the application if you want. "We are delighted to have Netflix partners in our SmartConnect HD STB," said Saurabh Dhoot, CEO, Videocon D2H. 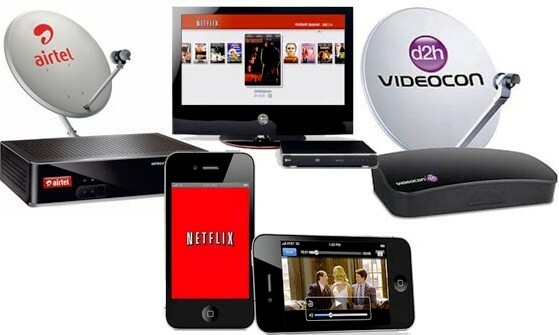 Netflix is ​​available via an application on the connected Videocon decoder, the SMART HD decoder. The decoder can connect via any Wi-Fi or Ethernet at home to access a number of processed applications, including Netflix, available on the Internet. The minimum Internet speed needed is 2 Mbps. Apart from these two associations, Netflix also are associated with Vodafone, and the integration of payments via Vodafone. This will enable Vodafone users to pay their Netflix subscriptions via Operator Billing, which is by their monthly bill or prepaid balance.